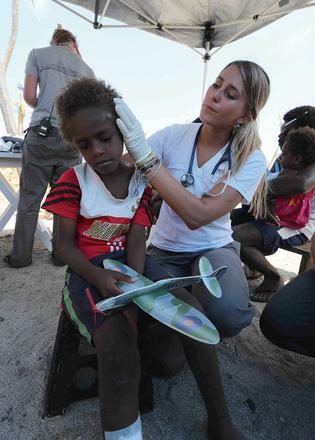 Following Pam Cyclone, Umbra was one of the yachts to provide aid to Vanuatu. Photos courtesy of Frank and Peggy. Cyclone Winston has wreaked havoc across Fiji, and with widespread devastation reported, YachtAid Global has asked nearby superyachts in the South Pacific to provide aid as soon as possible. The plea goes out to yachts based in Australia and New Zealand in particular. Yachts can help by picking up supplies from Cairns, Brisbane or Auckland and delivering them to assist the people of Fiji. They can also provide aid by donating money, using their water-makers to provide freshwater, and by transporting doctors and aid workers. Cyclone Winston brought 200 mph winds, torrential rain and 12 metre waves that battered the island nation at the weekend (February 20). The category five storm has been described by the Fiji Broadcasting Corporation as the worst storm to ever hit Fiji. More than 8,000 people have been forced to leave their homes and 29 have been killed. Rescue workers warned that the death toll could rise further as some of the more remote islands are yet to be reached. There is also the possibility of outbreaks of the Zika and Dengue viruses. YachtAid Global looks to support coastal communities in need by leveraging the generosity and support of the superyacht community. The non-profit organisation has partnered with Fijian authorities to make sure that aid goes to the people most in need. People on the ground are ready to assist yachts with streamlining the process. 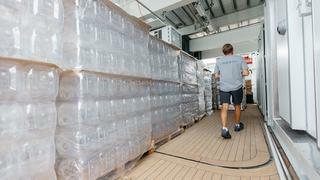 Following the effects of Cyclone Pam on Vanuatu last year, YachtAid Global was able to load superyachts with water, medical supplies and other necessities to deliver aid to Vanuatu’s outer islands. 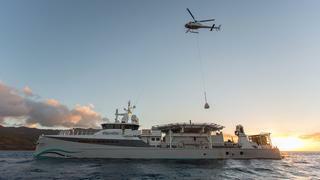 In some cases the superyachts were the first responders, providing life-saving water and critical support. The 51 metre Damen-built sea axe Umbra was one of the yachts to provide aid. The 73 metre Dragonfly was also particularly instrumental, transporting medical teams and aid from the island nation’s capital to more remote areas. They delivered more than 60,000 litres of fresh water, about six tonnes of food, treated over 250 casualties, arranged three helicopter evacuations and built shelter in several villages. With the devastating effects of Cyclone Pam still fresh in the minds of people across the Pacific, YachtAid Global is now looking for superyachts to step up to help Fiji. 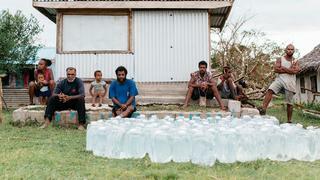 To find out more or make a monetary donation, please visit www.yachtaidglobal.org and quote 'FIJI'. _For superyachts looking to help with aid delivery, please contact captain Mark Drewelow or Dhardra Blake at info@yachtaidglobal.org_.